so you can continue to do the things you love. and GYROKINESIS® exercise with all the newest equipment. 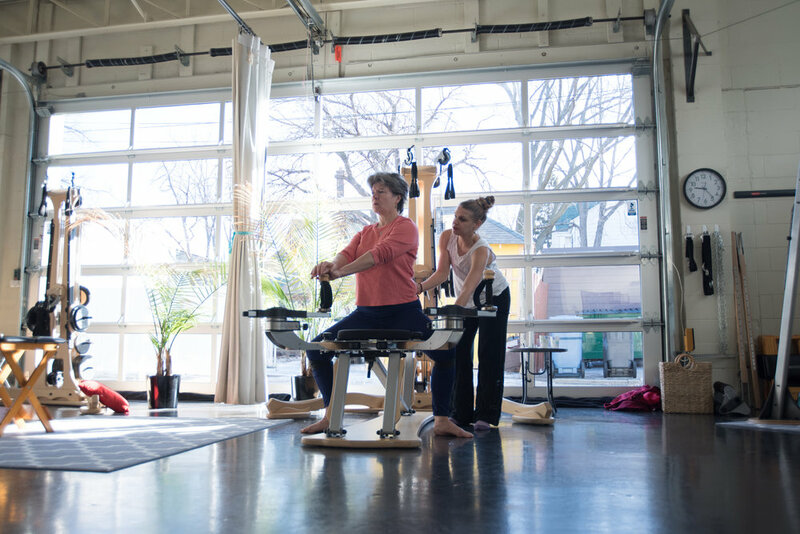 Embody Minneapolis inspires people of all ages and fitness levels to explore and discover our greatest potential through the GYROTONIC Method. We believe that be embodied is to connect to ourselves and the world, so we can access, experience and create the best life has to offer. The Gyrotonic method is a unique movement practice with roots in Yoga, Tai Chi and dance. Gyrotonic exercise sequences performed on equipment, are composed of spiraling, circular movements, which flow together seamlessly in rhythmic repetitions and corresponding breath. With Gyrotonic exercises, each movement flows into the next, allowing the joints to move through a natural range of motion without jarring or compression. These carefully crafted sequences create balance, efficiency, strength and flexibility. Regular Gyrotonic practice brings many benefits to all ages and fitness levels. It has been found to lift chronic pain and improve flexibility range of motion, balance, strength and energy. Gyrotonic classes can be adapted to fit anyone’s ability. The Gyrotonic method is practiced by people from all walks of life, including accomplished athletes and dancers, college students, baby boomers, senior citizens, and people with disabilities. Embody Minneapolis was born of Susan Gaines’s passionate belief that to be embodied — to be fully in one’s own skin — is to be fully alive: joyful, energized, graceful and strong. All instructors share Embody's vision and are dedicated to tailoring each session for your specific needs. Join us for this invigorating Sunday morning practice. Not too early, not too late. Just right for your morning wake up. Become a Gyrokinesis trainer or deepen your personal practice with the 6-day, two-weekend, intensive course. Prerequisite: Sucessful completion of GYROTONER® Course. This course introduces the Level 2 exercises and prepares students for the Gyrokinesis Level 2 Foundation Course. Having taught pilates for the past 9 years, Katie is very excited to add the Gyrotonic method to her repertoire. Having worked with clients of all ages and backgrounds she strives to find freedom in motion. Creating pain free, healing movement is her first priority. With women at the center of her work, she hopes to help other women honor, nurture and love their bodies through movement and self expression. Megan enthusiastically offers the freedom, grace, and joy of the Gyrotonic movement system to students at Embody. She has been captivated by the Gyrotonic method and how it challenges the physical, intellectual, emotional, and spiritual aspects of ourselves. 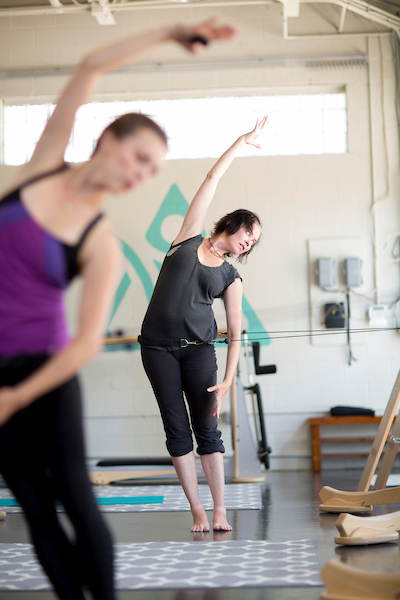 Kerry first encountered the Gyrotonic system in 1988 as a young dancer in Seattle. After a career in the ballet world, dancing for Pacific Northwest Ballet and The Vienna State Opera Ballet, she moved to New York to investigate other forms of dance/movement which is when she re-encountered the Gyrotonic system. When Ebony started practicing the Gyrotonic four years ago, she immediately noticed her pain lifting, and soon after, she felt her posture improve. "Having been a dancer off and on since I was young, I’ve always really enjoyed movement. The movement and flow of Gyrotonic is reminiscent of dance. I have always really enjoyed helping people." Brianne has been teaching GYROTONIC® since retiring as a professional ballet dancer from the Washington Ballet in 2008. Certified Gyrotonic trainer and pretrainer, Wendy has been active in the fitness/movement profession for over 25 years. Victoria's love affair with the GYROTONIC® method began in 2007, when she sought restorative, rehabilitative relief from the tension and pain created by her day job as a hair stylist.